NASA rated at the top of a list of eight government agencies along with the Centers for Disease Control and Prevention in a Pew Research Center survey last month. Highly educated Americans have an especially positive view of NASA. Nearly eight-in-ten (78%) of those with a graduate degree view the agency favorably, while just 11% view it unfavorably. Among those with no more than a high school education, 61% have a favorable impression of NASA and 21% view the agency unfavorably. Majorities of independents (70%), Democrats (68%) and Republicans (63%) have favorable opinions of NASA. Although NASA no longer sends its own manned shuttles into space – and instead is collaborating with private companies to continue supporting international space initiatives – most Americans still deem U.S. exploration of outer space to be important. In a 2011 survey, 58% of the public said it was “essential” that the U.S. continue to be a world leader in space exploration. Even as NASA’s mission in the world of space exploration has changed, its spending has been relatively flat over the past few decades (accounting for inflation). NASA spent $17.1 billion in fiscal 2014, which accounted for 0.5% of all federal government spending – or about one-ninth of the Department of Agriculture’s checks. 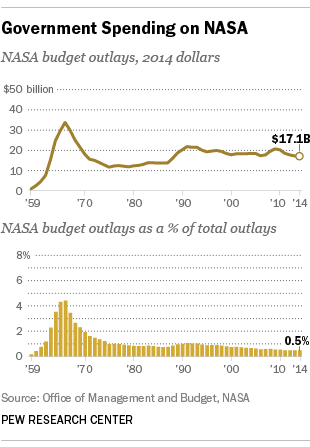 As a share of the federal government’s outlays, NASA dropped from more than 4% in the mid-1960s to about 1% of what the U.S. spent in the early 1990s. President Barack Obama’s 2016 budget requested $18.5 billion for NASA in fiscal 2016, up from an estimated $18.0 billion in 2015. Among other plans, the agency is developing the new James Webb Space Telescope and contracting with private companies to send astronauts to the International Space Station. When asked about the space station specifically, both the public and a group of American scientists say the U.S. has gotten a (big) bang for its buck. By a large margin, both the general public and members of the American Association for the Advancement of Science (AAAS) say the space station has been a good investment for the U.S., according to a Pew Research report released last week. More than six-in-ten Americans (64%) say it has been good for the country, while 29% say it has not been; among AAAS members, roughly twice as many think it was a good investment as a bad one (68% vs. 31%). 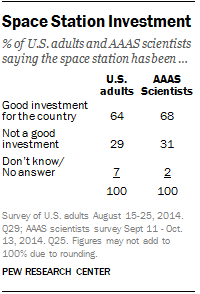 Among the public, there is bipartisan consensus about the value of the space station as well. Two-thirds of both Democrats and Republicans (66%) as well as 64% of independents say it has been a good investment for this country.